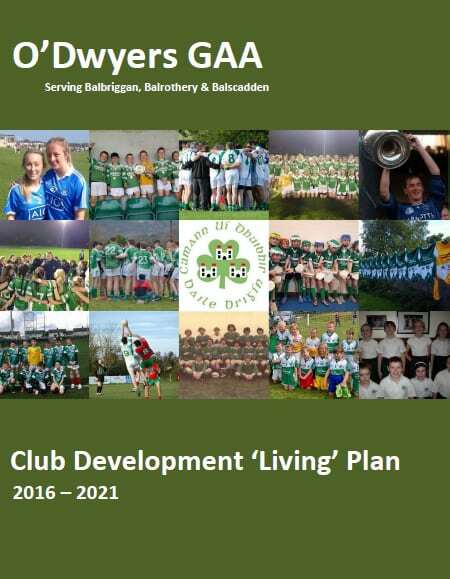 In early 2016 a decision was taken by O’Dwyers Club to develop a five-year strategic development plan. The purpose of this development plan was to guide and advise on-going management and development so that the O’Dwyers GAA Club can maximise its beneficial influence on the local community. This plan covers many different aspects of the Club including fundraising and financial management, Club structures and administration, membership, games development and coaching, public relations and facilities development. It allows a Club to decide its priorities and set our own objectives towards achieving them. In the preparation of this Plan, the bottom-up approach was used with input from a very wide range of members and Club stakeholders. If you would like to get involved in putting the actions of this plan in place please contact us on info@odwyersgaa.com. Some pictures from our Launch Night and Family Day can be found on Balbriggan.info.